In September 2015 it will be 100 years ago since the last train ran along the Redruth and Chasewater Railway to Devoran. One of the railway buildings quickly became the Village Hall and there are plans to mark the last running in September 1915 and the varied life of the Village Hall over the last 100 years with events for all the family. There is a meeting organised by the Community Association and the Devoran Village Hall Committee at the Village Hall to discuss plans on Friday 23rd January 2014,7.30 pm. 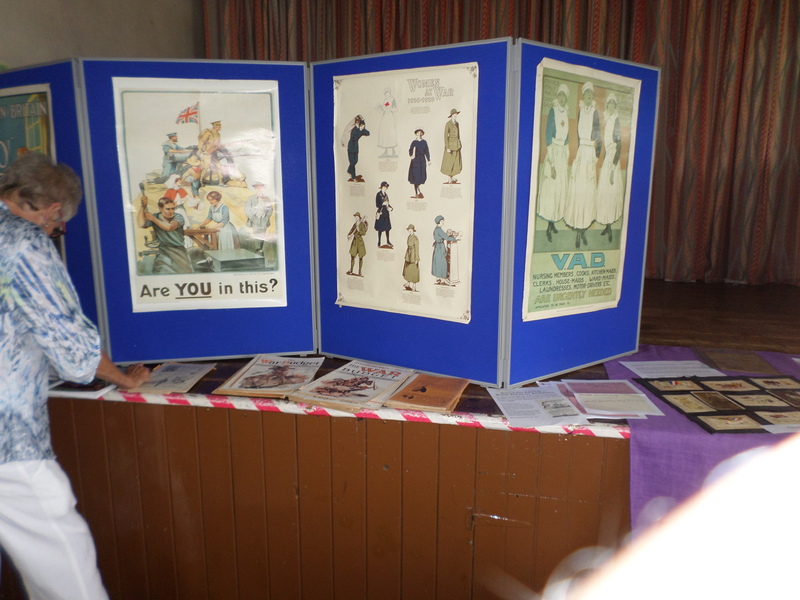 All are welcome and memorabilia of the many varied activities of the Village Hall is sought. I have returned Tony Dyson’s 2007 purple folder of research into the Devoran War Memorial back to Devoran Church, along with the updated version that Bob Richards and I worked on for the Poppies Coffee Morning, so hopefully these will be of some use and interest on the day. Mark Norris, Devoran War Memorial project. 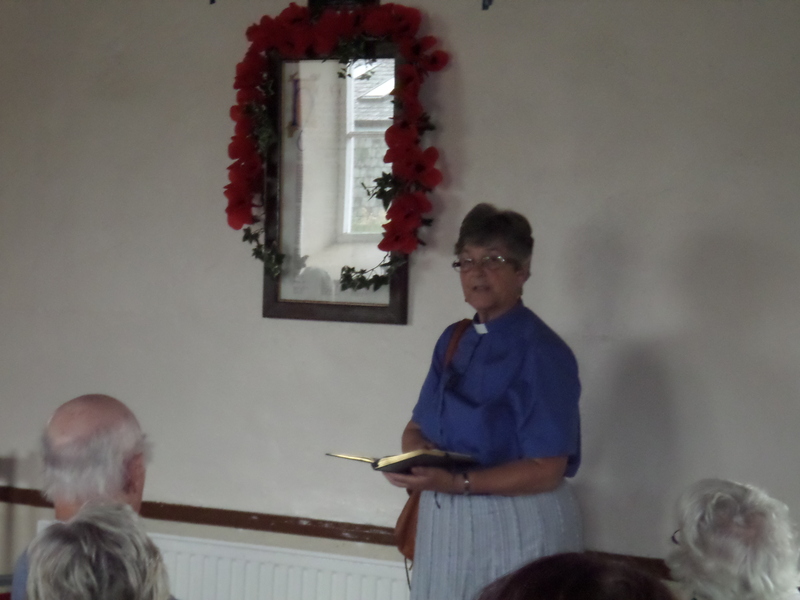 Event photos from Poppies Coffee Morning 19 July 2014, 10 am to 12 noon. Devoran Village Hall, Quay Road, Devoran. 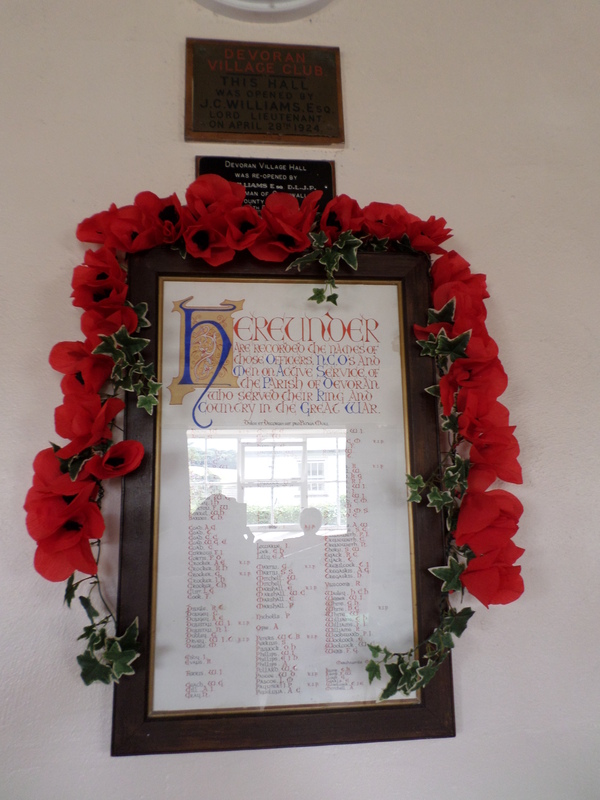 The roll of honour lists all those men from the parish of Devoran who served in WW1 – see more on our blog post on the Roll of Honour. The unveiling of the handmade poppies was followed by a short talk from Parish Councillor Bob Richards on his war memorial research. 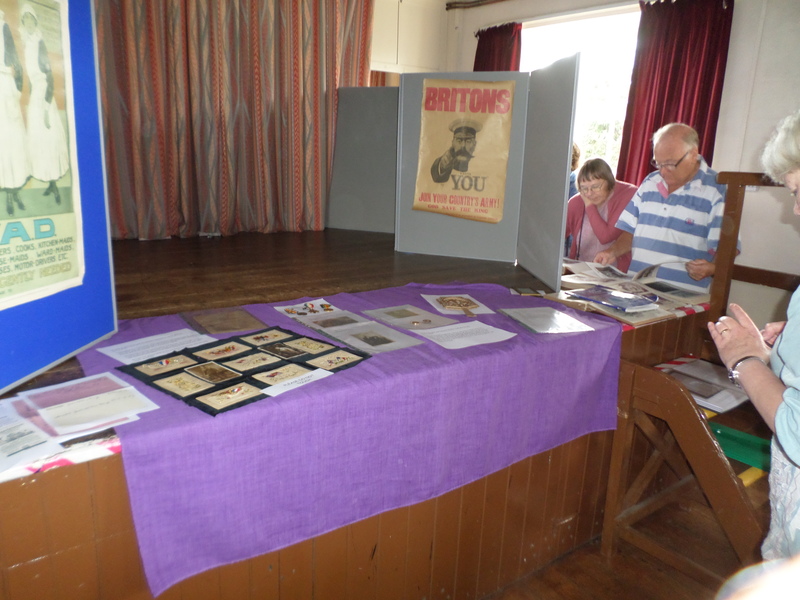 There was also a ‘Bring and Buy’ stall and raffle for the ongoing Village Hall Restoration fund and a display of WWI memorabilia. 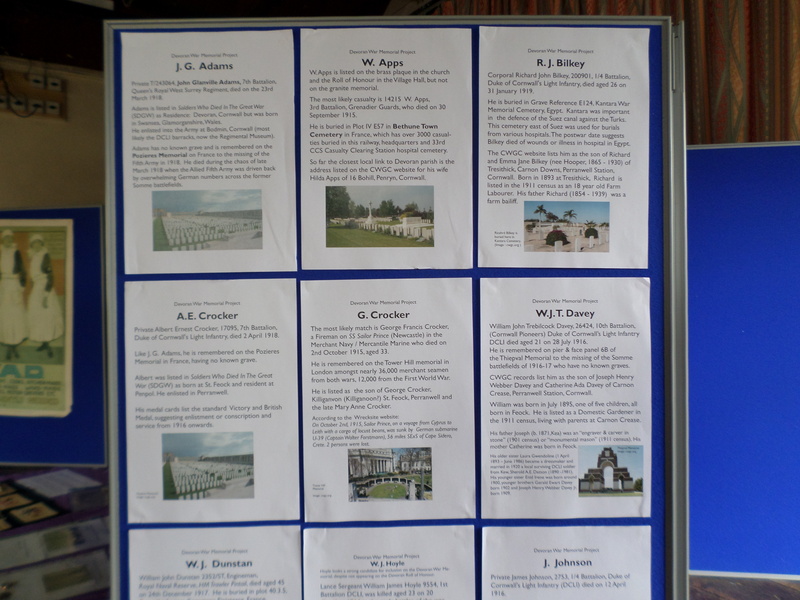 June 2014 – Bob Richards on behalf of Feock Parish Council has been looking at any missing names from WW1 and WW2 that may be added to the Memorial as part of the commemoration of the WW1 centenary http://www.1914.org. So far it looks like Percy Sweet and W.J.Hoyle (or Moyle) will be two names added to the WW1 names. Several ‘missing’ WW2 names are being considered. 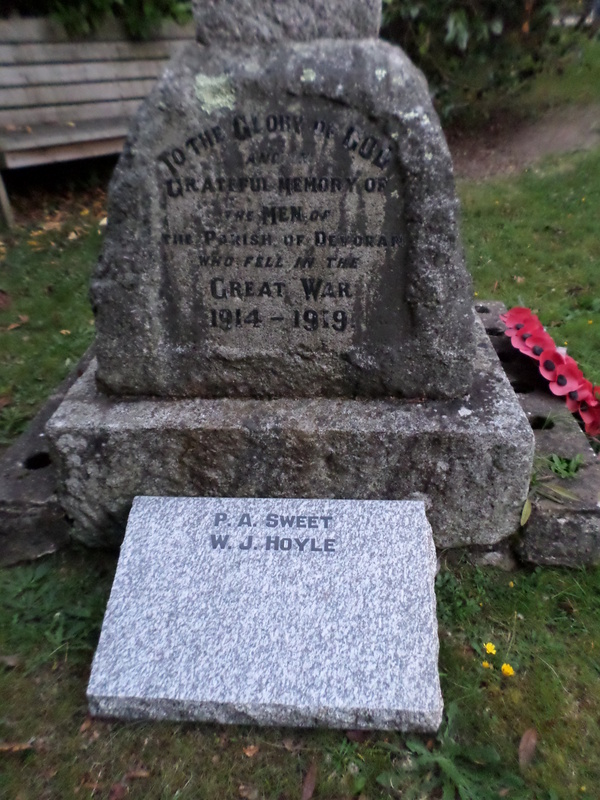 You can read more about Devoran related WW1 and WW2 casualties not recorded on the granite war memorial at present on the following blog post. Keep a watch for more news on memorial events or exhibitions in summer and autumn 2014 on this page or visit the Devoran Village Hall website etc. In particular we are keen to locate family photographs of the casualties to put names to faces. William John Dunstan 2352/ST, Engineman, Royal Naval Reserve, HM Trawler Pintail, died aged 45 on 24 December 1917. He is buried in plot 40.3.5 Brest Kerfautras Cemetery, Finisterre, France. The CWGC website lists him as husband of Juliana Dunstan of 6 Chapel Terrace, Devoran. William was born in Hayle, Phillick (Phillack?) in Cornwall in 1874. In the 1911 census he is listed as “Fireman Steamship” living at Chapel Terrace, Devoran. In the 1901 census he is a single 26 year old man, a fireman aboard the Steamship Erimus, a frequent visitor to Devoran’s mineral quays. I mostly grew up in Devoran. I remember Miss Webber, the teacher, who you mention. I also remember our post lady who also ran the Post Office who was called Joyce. I also remember the butchers van visiting weekly. My grandparents were Eddie and Phyllis Dunstan of Chapel Terrace. I had family who lived at Greenbank as well. Many’s the happy day I spent out in the boat with my grandad or hanging around on the Quay. My parents and grandparents were both married at Devoran Church. I had a wonderful childhood in Devoran and have bundles of old photos from early 1900s, just not sure who is who in a lot of them. I ordered Devoran and Its River from Amazon after exploring your site and have been really enjoying it. Such an amazing source of information. Amazing that so many pictures are so well named in detail. Just looking through it and knowing I’m probably looking at some of my ancestors. I’m encouraged to sort out my old Devoran photos and will do so and scan them in the hope they may be of interest to others. I’ll be in touch when my project is finished. So nice to hear back from you. Hopefully Willie Dunstan’s picture may be amongst them. Not sure what sort of naval uniform they would wear on an armed minesweeping trawler. Mark, Devoran War Memorial Project blog.